I have been doing some reading on Christmas traditions from Ireland. Here are some recipes that may be used in many Irish Christmas dinners. Enjoy! Remove the turkey from the fridge several hours before cooking as it must be at room temperature before cooking to prevent the turkey drying out in the oven. Prepare the stuffing: In a large bowl mix together the onion, pork sausage meat, herbs, breadcrumbs and a pinch of salt and pepper. Slip your fingers under the skin at the neck end and loosen to create a cavity over the breast. Stuff the neck end with the onion and sage stuffing up to the breast. Tuck the loose skin underneath and secure with a fine metal skewer. Smear the soft butter evenly over the breast and legs of the turkey. Lay thin slices of bacon neatly across the breast and top surface of the legs. Sprinkle the whole turkey liberally with salt and pepper. Lay two large sheets of aluminum foil over a roasting tin large enough to hold the bird. Place the bird back down and fold the foil loosely over the bird leaving a roomy gap between the bird and the foil to allow steam to escape. Roast in the preheated oven for 40 minutes then lower the temperature to 325°F/160°C/Gas 3 and cook for 3½ hours basting from time to time. Remove the turkey from the oven, raise the temperature to 220°C/425°F/Gas 7. Fold back the foil on the turkey, remove the bacon and pour any juices into a jug or bowl. Return the turkey to the oven and cook for a further 30 mins to crisp the skin. Remove from the oven and check the temperature with a meat thermometer placed into the thickest past of the thigh, the turkey is cooked if the temperature is 175°F/80°C. If you don’t have a thermometer the turkey is cooked if the juices run clear when the thickest part of the thigh is pierced with a small sharp knife. If the juices are pink return to the oven and cook until they run clear. When cooked, leave the turkey to rest for 30 minutes wrapped loosely with fresh foil before carving. Meanwhile make the gravy. Pour all the juices from the roasting tin into the bowl or jug with the juices saved from the foil. Spoon off all the fat which will float to the surface and discard. Place the roasting tin on a high heat on the stove top, add the flour and stir to scrape up all the sediment from the tin. Cook for one minute. Pour in the port and stir well then add the stock. Bring to the boil and simmer for 5 minutes. Add the turkey juices, bring back to the boil and cook for a further 3 minutes. Add the redcurrant jelly stir until dissolved then strain into a gravy boat or serving jug. * Cream butter and sugar; add in Large eggs, brandy, rose water and orange extract and beat till fluffy. Sift flour, all spice and salt. Stir in ground almonds and stir flour mix into creamed mix. Stir in whole almonds, fruits and peels. Grease a 19-inch springform (tube-type) pan and place on baking sheet. Pour batter into pan and bake at 300 degrees for 2 to 2 1/2 hrs. * Cold in pan on rack. Remove sides from pan and cold cake on rack. Frost with almond paste as follows. Place of an 8-ounce. can of almond paste in layers of waxed paper and roll to 1/8- inch thick. Press pcs against side of half the cake, repeat with second half of can. Roll another 8-ounce. can of almond paste to a 10-inch circle, 1/8-inch thick, cut center away and place circle on top of cake. pat sides and top together. Finally, frost with Royal Icing. Make icing by combining 2 egg whites at room temperature, a lb. package of powdered sugar,1/2 teaspoon cream of tartar and 1 teaspoon vanilla in a small mixer bowl. Beat till very stiff. Frost cake immediately because frosting gets very hard. Wrap cake well in tightly covered wrapping or possibly in container. Christmastime in England is a merry time, a time of lights, of singing, of feasting, and of storytelling. The lights brighten up the darkest days of the year. The singing adds joy to the most joyous time of the year. The feasting brings family together, and the storytelling ties the past to the present. The Christmas season comes to England during the time of the winter solstice, the shortest days of the northern hemisphere’s year. It is no surprise then that lights play a big part of British Christmas decorating. Homes are decorated inside and out with candles and strings of Christmas lights. Many towns put up elaborate light displays and turn them on with much pageantry. Evergreens are a favorite for decorating the house. Mistletoe, holly, ivy, bay laurel, and yew dress the rooms and mantles of many houses. But the favorite evergreen decoration is the one that stands in a corner of the family room: the Christmas tree. Many British Christmas trees are live trees dug up, placed in a pot, decorated, and replaced in the ground once the Christmas season ends. Artificial trees and live cut trees are used as well. Decorating Christmas trees in the home became popular after 1848 when Prince Albert brought one into Windsor Castle for his children’s enjoyment. Before Christmas trees became popular kissing boughs, made of holly, mistletoe, and other greenery with ribbons, apples, and candles attached, were the focal point of Christmas celebrations. As families receive Christmas cards they hang the cards as decorations. Many cards are sent every year to friends and family members. The Royal Mail handles millions of cards every year so there are plenty of cards decorating every house. The very first Christmas card was produced in England. John Calcott Horsley designed the first Christmas card in 1843. About 1,000 copies were sold for a shilling a piece. Fewer than 15 still exist. Caroling is one of Britain’s oldest Christmas customs. Some of the first carolers may have been beggars singing for food, drink, or money. Later, groups of musicians would walk through town singing and playing musical instruments beneath the windows of townsfolk until citizens started complaining about being awakened rudely by the carolers. Today carolers meet in homes, street corners, and churches to sing their joyous songs. The carolers then go from house to house singing Christmas carols. Sometimes they are invited in and given hot drinks, food, or money. Some believe that inviting carolers into the home brings the family good luck. Many organizations present programs of carols often collecting money for charities. These programs may include one of these carols which are the oldest known British Christmas carols possibly dating back to the Middle Ages: “The Holly and The Ivy”, the wassail song, “The Boar’s Head Carol”, and the “Yule Log Carol”. Another form of caroling enjoyed by the British people is wassailing. When people go visiting friends and neighbors and drink from the wassail bowl, they are drinking to their health. People who go wassailing take a bowl of wassail with them. When they are invited into a house they sing a special wassail song and drink to the health of the host and his household. It is considered bad luck to refuse to invite wassailers in. In rural areas people take wassail to drink to the health of farm animals, crop bearing trees, like apple trees, and farm fields. For many in England Christmas Eve is the beginning of the Christmas season. Christmas Eve is still a workday, but many companies close early so their employees can get ready for the big day. Shops, however, stay open to handle all the last-minute shoppers. Children who have not done so earlier will write their letters to Father Christmas and throw them into the fireplace. Tradition says that the smoke from these letters goes to Father Christmas telling him what the children want. Modern children may mail their letters to Father Christmas if they write them soon enough. In the afternoon many people will tune in their radios to listen to Carols From Kings, a program of Christmas carols sung by the choirs of Kings College. As night falls on the English countryside many families open one small gift before going to bed. Many times this gift is a pair of pajamas. Other families get ready to attend Christmas Eve services at midnight at their local churches. Children hang either a stocking or, if they hope to get more from Father Christmas, a pillow case on the fireplace or on the end of their bed. They may also leave a mince pie and a drink for Father Christmas and carrots or straw for his reindeer. Father Christmas will come to fill the stockings or pillow cases when everyone is asleep. Father Christmas differs from the American Santa Claus in that he is tall and thin, wears a long red coat, and may wear holly on his coat. Like his American counterpart he has a long white beard and arrives on top of houses in a sleigh pulled by reindeer. Originally, instead of a hood or hat, Father Christmas wore a wreath of mistletoe or holly on his head and a robe of red, green, white, or brown. On Christmas morning stockings are emptied first. After a sumptuous breakfast those who did not attend a Christmas Eve service go to church. At mid-day Christmas dinner is served. A traditional Christmas dinner consists of roast turkey or goose, brussels sprouts, roast potatoes, cranberry sauce, stuffing, tiny sausages wrapped in bacon (pigs in a blanket), and gravy. This meal is followed by rich desserts: plum pudding, mince pies, and Christmas Cake. Plum pudding is traditionally made several weeks before Christmas on Stir-Up Sunday. Every member of the family stirs the pudding in a clock-wise direction and makes a wish. To do otherwise is bad luck. Plum pudding is made up of spices, nuts, and fruit. At one time plums were used but raisins are now used instead. A coin is also put into the pudding. The finder of the coin on Christmas day gets good luck in the following year. Mince pies were once made with shredded meat. Now, however, they are made with fruit and nuts. One tradition says that one must eat one mince pie every day during the twelve days of Christmas to have good luck all through the year. Christmas Cake is a fruity cake covered with marzipan followed by icing and decorated with plastic Christmas figures. At some point during Christmas dinner everyone, usually with the help of the person sitting next to them, opens the Christmas cracker placed by the dinner plate. Christmas crackers are named for the sound they make when they are opened. Everyone, adults included, look forward to seeing the surprises waiting inside: a paper hat to wear, a small toy like a spinning top, and a joke to share. At about 3:00 pm the family gathers around the radio to hear a special Christmas message delivered by the Queen to her subjects all over the world. This tradition was started in 1932 by King George V.
At approximately 6:00 pm, families gather, perhaps at the home of a relative or a special friend, for Christmas tea. Once again the fare is sumptuous. A variety of cheeses, pigs in a blanket, voulevonts, carrot and celery sticks, a variety of dips, Christmas Cake, mince pies, snowman buns (cupcakes), or a Yule Log Cake may be served at Christmas tea. December 26th, Boxing Day, is another holiday for the British people. This is the day churches traditionally opened their donation boxes and distribute the money collected in them to the poor. People would also give gifts of money, food, or other items in “boxes” to postmen, garbage collectors, and other people who serve them. Boxing Day is often spent visiting family and friends, attending equestrian events or other sporting events, and just having fun. During the Christmas season many families attend a Christmas pantomime. These pantomimes are not like American pantomimes where there is no spoken words and no props, just the mime and the audience’s imagination. British “pantos” have elaborate costumes and sets. Actors may not use a script, but they interact with the audience. Some favorite stories used in these pantomimes are Aladdin, Alice in Wonderland, Puss in Boots, and Peter Pan. 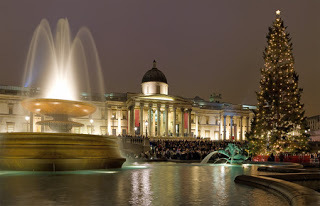 Twelfth Night, January 5th, is the last day of England’s Christmas season. All Christmas decorations must be taken down by the end of Twelfth Night or bad luck will come to the house. This classic steamed pudding is delicious with brandy butter, cream or custard. 1. Liberally grease a pudding mould. 2. In a large saucepan combine butter, sugar, milk, dates, sultanas, currants, mixed fruit peel and zest of the orange; bring to the boil. Remove from heat and stir in bicarbonate of soda. Sift in the flour, cinnamon and salt; mix gently until blended. Pour into prepared pudding mould. 3. Cover with a double layer of greased greaseproof paper and steam for 2 hours.